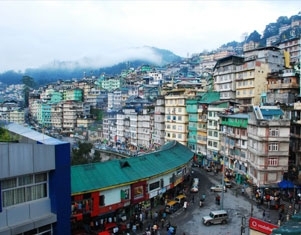 Gangtok is a beautiful hill town and the capital of north-eastern state of Sikkim. This is one place which many tourists like to combine along with a visit to Darjeeling. In fact the combined trip of Darjeeling-Gangtok is a common recipe when people think about visiting this part of the country. "Baba" Harbhajan Singh (August 3, 1941 – October 4, 1968) was an Indian army soldier who died near the Nathula Pass in India. He was revered by the soldiers of the Indian army who have built a shrine in his honour near the Lake at an altitude of around 4000 meters / 13123 feet. Local sightseeing visit Institute of Tibetology, Dordul Chholten Stupa, Rumtek Monastery, Ropeway Ride and Shanti view point.